← Petrol smell in Riesling is a mistake? Kayra Wine’s “Terra” brand has started a nice event called “World Cuisine with Terra Wines”. “Italy” was the first “stop over” of this serial event. 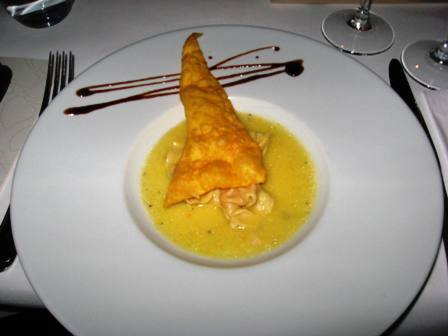 We had a chance to meet and taste the dishes of Italian Chef “Gianfranco Chiarini” at “Mia Mensa” restaurant in Istanbul. Chef Chiarini has an interesting understanding of Italian cuisine which he reflects his experiences from Europe to Africa, Turkey to Middle East and even Far East. 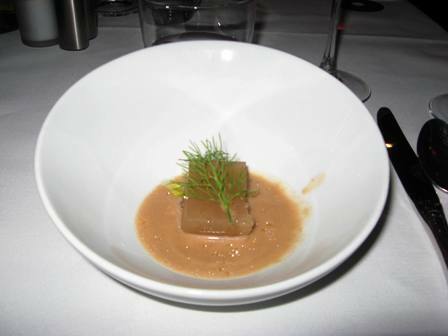 Our first course was “fresh parmesan cubes over delicate infusion of Apples in Marsala wine, garnished with crispy Basil”. We taste “Terra Italia Pinot Grigio 2009” and “Terra Sauvignon Blanc, 2010” with this course. One of the positive things regarding Terra’s event was that we had the opportunity to taste two different Terra wines with each course which contributed to evaluate the wines, their styles and their pairing with the food. That was a really nice idea actually. There was “foam” on the top of the dish. Although it was not mentioned in the menu, I asked it to Chef what kind of ingredient he used for the foam. He replied me that he used “white wine, honey and white truffle” for it. Certainly creates a higher value for the plate. The Parmesan cube used for this course was quite hard and we asked this point to the chef, he told us that “it is a 24 months matured parmiggiano”… very interesting choice… I ask him whether we can use “Pecorino Romano”, he replies “then, the dish would have a much more different structure and intensity so that it may create a different dish”. Our second course was “Tomato-saffron consommé gelée in Trifolati Porcini suspension, over Parmesan Green Tea Velouté”. We tasted “Terra Italia Chianti 2009” and “Terra Kalecik Karası 2010”. “Porcini trifoliati” and “tomato-saffron consommé” was served as quite “cold gelée”. “Velouté” is one of the classical and basic sauces of French cuisine and creates the basic sauce for creamy soups. Classical “trifolati” is actually an Italian version of typical “sautéed mushrooms”. Accordingly, Chef Chiarini serves us these two classical French and Italian dishes with a different style (together with tomato-saffron consommé) and brings to the table a much more different view. He also creates a synthesis between east and west while using the spices in this dish (such as saffron). Our next course was “Ferrara style Cappelacci filled with roasted Pumpkin & Parmesan, over a refreshing Butter emulsion with Orange zests”. Actually this was one of my favorites during the event. This is an alternative version of typical “Cappellaci” with a sauce of containing serious amount of butter base with orange zest. Slightly sweet roasted pumpkin and parmesan cheese made a good balance together. We had two different wines made from Kalecik Karasi grapes: “Terra White Kalecik Karasi 2010” ve “Terra Kalecik Karasi Rose 2010”. “White Kalecik Karasi” has never been experienced before in Turkey and it is certainly a “brave” attempt. It has a very open pink color with highlights of open pale onion peel. Totally produced as per white wine techniques. On the nose we feel nice citrus aromas and light red berries while on the palate we’ve got continuous citrus and strawberry effects. Light bodied with medium-low acidity and quite sweety. This is certainly ideal for this summer. In my opinion “Terra White Kalecik Karasi” had a better match with the “Cappellaci” due to its slightly sweet structure. By the way, “Terra Kalecik Karasi Rose” 2010 vintage is also nice which has very nice red berry flavors together with some floral notes. 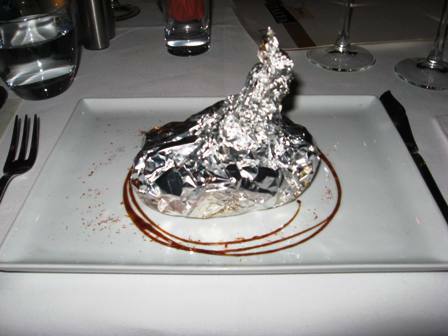 The only seafood dish in the menu was “Sea bass fillet in foil, blanched in its own juices and Frutti di Mare Neapolitan infusion sauce” which was served in an aluminum folio. We tasted “Terra de France Chardonnay 2007, Languedoc” and “Terra California Chardonnay 2006, Central Valley-Lodi” with the dish. When I opened the aluminum folio, at the beginning I thought that chef made us such a surprise that the dish was quite raw. After then I checked my wife’s dish and saw that her plate was cooked. While I was exactly calling the waiter to ask what’s happening, the head waiter of “Mia Mensa” came to our table and immediately changed my plate by saying that my dish was “raw”. I immediately thanked him for his interest and attention. “Sea bass fillet” was a real Mediterranean dish. For me, a rose wine would also match well with such dish, however, in any case, “Terra de France Chardonnay 2007” which comes from South France’s Languedoc region also matched well especially in terms of its well oak integration. On the other hand, “Terra California Chardonnay” could not meet that level due to its high oaky notes. 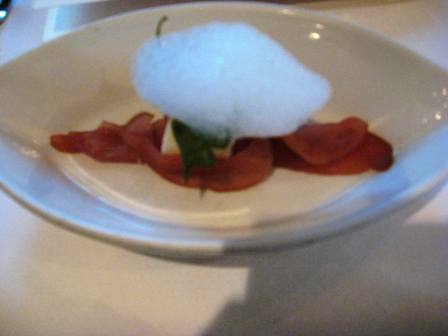 In order to fresh our mouth we had “Sweet spring smouthie sorbet” before passing to the “beef tenderloin”. After sorbet we had “Beef tenderloin fillet cubes, grilled to perfection, over light bitter Chocolate & Chili demi-glace, garnished with grilled vegetables de saison, accented with Umbrian cold pressed Extra Virgin Olive Oil Malt dextrin sand” together with “Terra Italia 2004 Barolo” and “Terra Shiraz 2009, Denizli”. 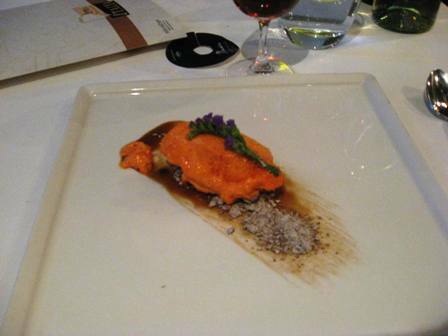 In this course, Chef Chiarini uses a “sand effect” technique of molecular gastronomy which is called “Malt Dextrin”. He uses “Tapioca root” belongs to South Africa instead of using chemical. This is a kind of technique where you mixe a liquid (in our case it is Umbria olive oil) and the grinded Tapioca root, then it turns into like “white sand”. There is a nice presentation on the plate where you can see the “bitter chocolate” applied and touched by brush and on the top “sandy olive oil” lies on. Beside we’ve got the “chili pepper demi-glace sauce” nearby the “beef tenderloin”. May be the only default of this dish was that – the beef was over cooked-. However, a medium-rare beef would reach to a top level. In any case, this is a very nice and enjoyable dish. In my opinion both wines matched well with the beef tenderloin. May be Barolo’s body structure was better than Shiraz. 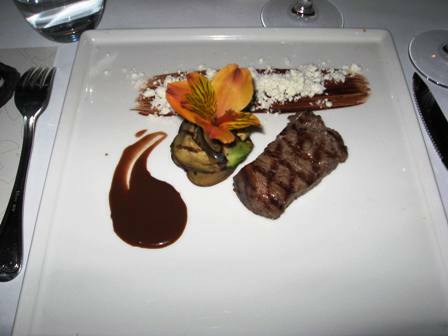 But, the spicy and chocolate aromas and general body structure of Shiraz had also enough level to carry out the dish. I like matching “capsicum” with “cacao” and Chef Chiarini uses a similar type of match for the dessert. “Red Capsicums Parfait, perfumed with Rosemary infusion, drizzled with Espresso ganache delicately scented with Amaretto di Saronno” was served with Kayra’s classical Madeira stype wine “Madre 2006”. We see a typical opposition of “capsicum” vs “cacao”, he uses “espresso” instead of “cacao”. This parfait is a type of “semifredo” actually means “semi-frozen” which makes a good integration between different flavors. Another example of such dessert is the opposition of “chocolate” and “hot paprika” which I like a lot. I heard that in the upcoming months they will also have a same type of event for “French” cuisine which made me very excited actually. This entry was posted in barolo, Chardonnay, Istanbul, italian wines, Kalecik Karasi, Kayra wines, pinot grigio, Restaurants, Rose, sauvignon blanc, sweet wines, Syrah/Shiraz. Bookmark the permalink.